Lighthouse Consulting Group, LLC, (www.lgcllc.biz) has developed two products, CheckFaxRDC and CheckScanRDC, targeted at serving small and home office based businesses with low volume check deposit requirements. In an effort to better understand the characteristics of this market segment, Lighthouse Consulting Group has conducted web based surveys in 2007 and again in 2010-11. The results of the more recent survey are described below. • Small and Home Businesses are very much interested in obtaining the benefits of RDC that are offered to larger businesses, but aren’t seeing them yet. • 70% of respondents were interested in a way to deposit checks without making a trip to the bank, up from 58% in the 2007 survey. • RDC penetration of the small business market is very, very low. • The vast majority of checks are still being deposited using tellers, as in 2007. In the 2010 survey we are just starting to see the use of dedicated check scanners. No respondents reported using cell phones, flat bed scanners, or multi function devices (MFDs) for RDC. • Small and home businesses have a high value associated with each check deposited because of: 1) having a low deposit volume over which to spread the cost of going to the bank, and 2) often having high value personnel making the trip to the bank. • For respondents, the average value per check deposited (not the check amount) was $17. This suggest a variable cost RDC solution can charge significantly more per check than is currently being charged high volume depositors. • Respondents are interested in using a variety of existing devices to enable RDC. • Cell phones do not appear to be the device of choice for most respondents. • Respondents are interested in using a variety of existing devices to enable RDC – document scanners, multifunction devices and fax machines; and to a lesser extent cell phones. • Of those interested in an RDC solution, 54% were interested in using a special carrier to fax checks to their bank. • Those interested in using a special carrier to fax checks to their bank would be willing to spend on average $.37 additional per check to make the deposit from their office. Different groups have different price points with peaks at $.10, $.25, $.50, and $1.00. While the question was asked to those interested in a carrier based Fax solution, the results could probably be safely applied to all types of RDC solutions. • How are deposits are handled today? • What is the level of interest in RDC? • What type of scanning equipment do businesses have? • What is their level of interest in using existing devices for RDC? • What is the value on a per check basis of an RDC solution and how much would those interested be willing to pay. Even though considerable effort went into getting responses, the sample is small (n=106). We believe what we have is good directional information. Where the same question was asked in 2007 and 2010, the results are consistent. Overall the results are consistent with our 8 years of RDC experience. • Survey respondents, were similar to those participating in the 2007 survey. • The average number of employees was 6. Range was from 0 to 75, with a median of 2. • They deposited mostly checks - 85% and as such can be characterized a non-cash businesses. • The average number of trips to the bank to deposit checks was 4.3. The range was 1 to 22, with a median of 3. Most respondents were not daily depositors. • The value per hour of the person going to the bank was $89. However that is not a very meaningful statistic as the plot of value per hour is bi-modal with a significant tail. There is one peak at $10-$30/hour extending out to $50. A somewhat lower peak occurs between $100 and $200. The tail then goes out to $500. The first peak likely represents businesses that have a junior employee responsible for accounts receivable, although not necessarily full time. The second peak and tail likely represents professional services businesses, which get a few large checks and making bank deposits are a collateral duty. This rather large variability in value of the person doing the banking is not surprising when one considers the wide range of industries encompassed by the term small business. From other work we know that the average size of check received varies by orders of magnitude between industries. 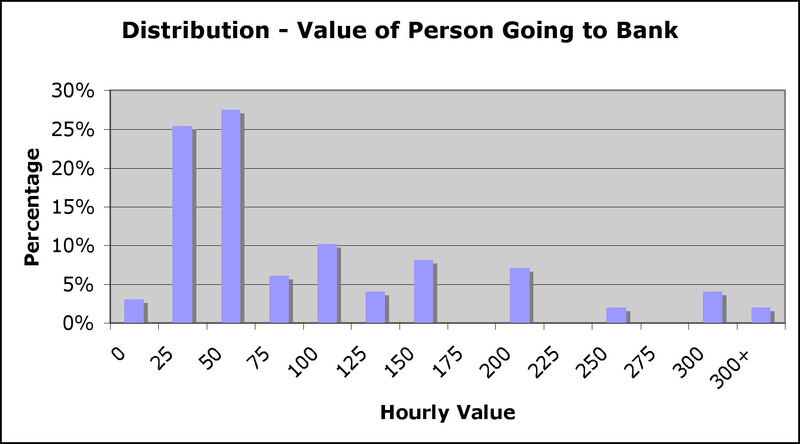 This variability in the value of the person going to the bank becomes important later when we look at the value per check, and the price per check that respondents were willing to pay to avoid a trip to the bank. • For respondents, the average value per check deposited (not the check amount) was $17. The value per check deposited is calculated based on the number of trips per month to the bank, time spent per trip, value of the person making the deposit, and the number of checks deposited per month. 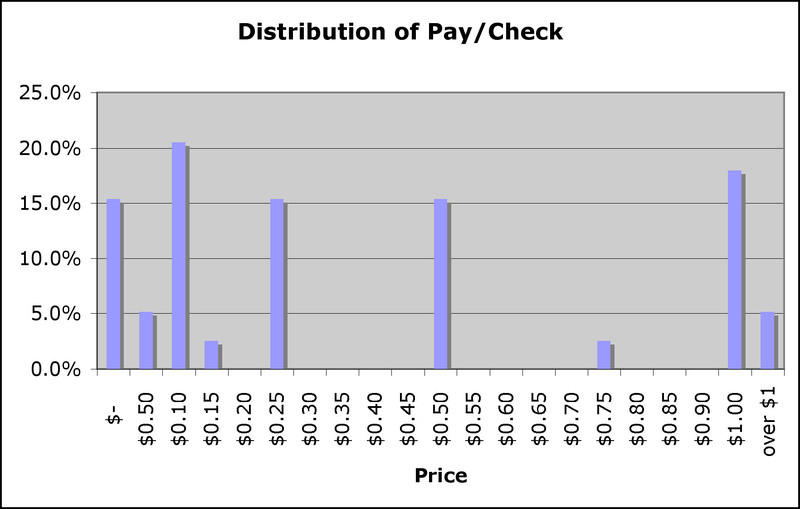 The calculated per check value ranged from zero to $150, with a median of $5.56. Clearly most of the respondents have some basis for paying a fairly significant amount to get the benefit of RDC, as the following table shows. • A high check value is often correlated with a high value person going to the bank. The range of check values can be quite wide. 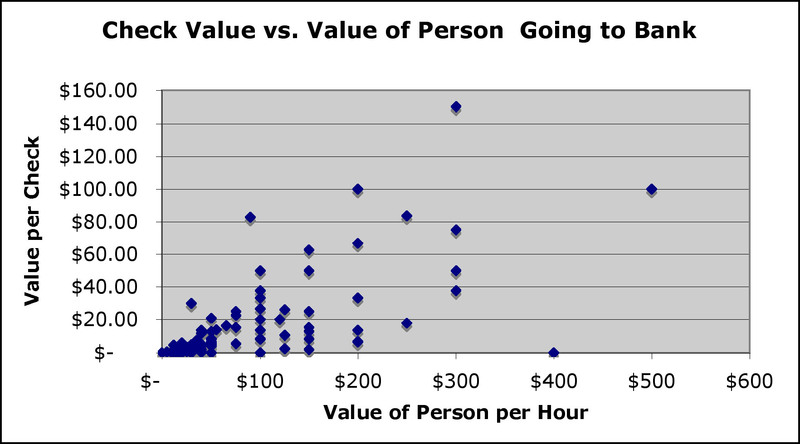 Even where the value of the person going to the bank is under $50, there is considerable variation in the in the value per check between $0 and $20 per check (lower left hand corner of graph). 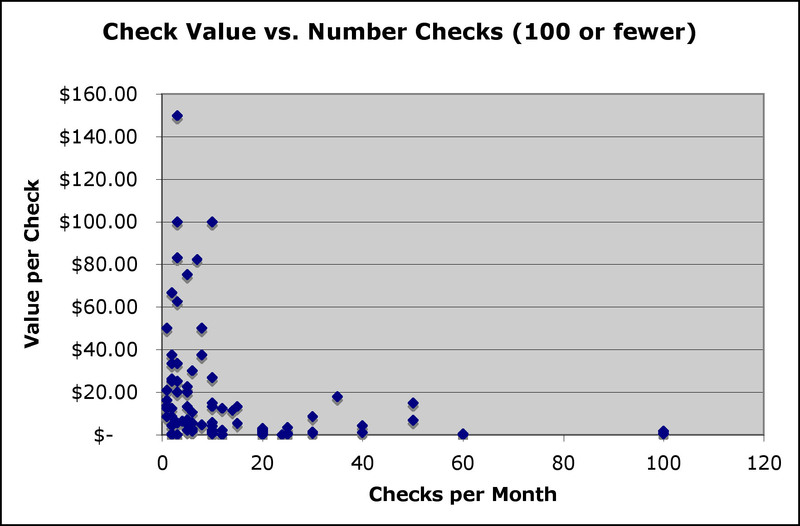 • Not unexpectedly high values per check are also correlated with relatively low check volume. The chart below shows the wide range in values for those depositing 20 or fewer checks per month. Also, in the horizontal $0 to $20 value band, there is considerable variation in value at volumes above 20 checks per month. • The vast majority of checks were deposited using tellers, as in 2007. In 2010 we started to see the use of dedicated check scanners. No respondents reported using cell phones, flat bed scanners, multi function devices (MFDs), or fax machines. The following chart shows the difference in deposit method for: 1) All respondents, 2) those Interested in depositing checks without making a trip to the bank, and 3) those interested in using a special Carrier to Fax checks to the bank. 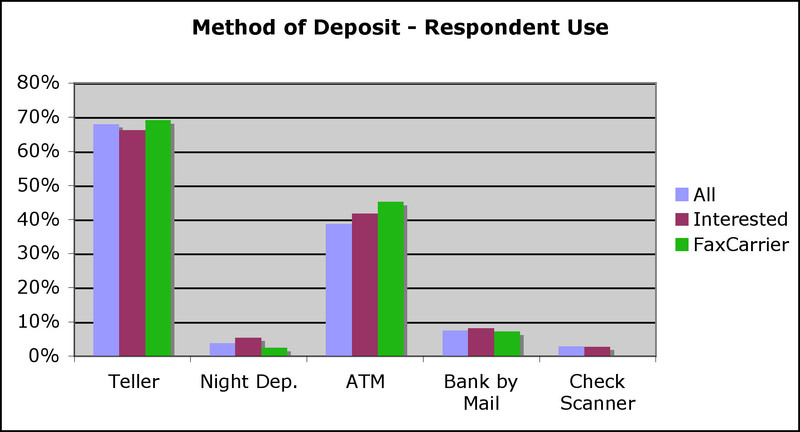 • The methods respondents indicated they used to deposit checks are show above. 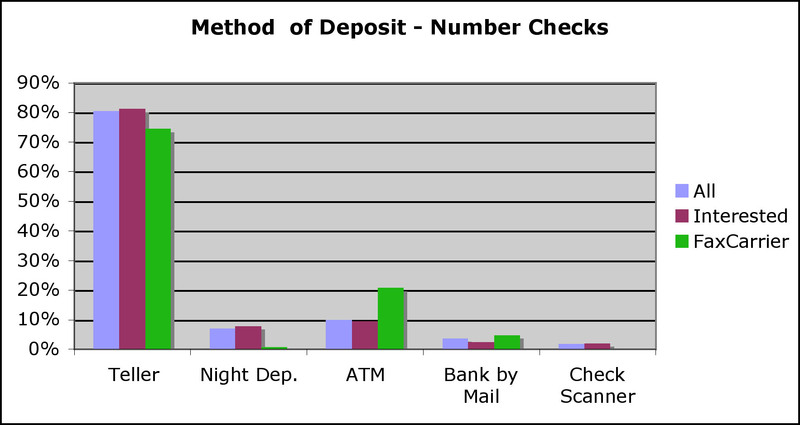 Compared to the graph, which is based on number of checks, there is a somewhat greater use of ATMs and Bank by Mail. Compared to the 2007 survey, in 2010 there is greater use of ATMs and less use of Bank by Mail. • 70% of respondents were interested in a way to deposit checks without making a trip to the bank, up from 58% in 2007. • 40% of all respondents were interested in using a special carrier to fax checks to their bank. Of those interested in an RDC solution, 54% were interested in using a special carrier. • Nearly 100% of respondents had office computers and Internet. • 96% of respondents have at least one of the following: document scanner, MFD or Fax machine. 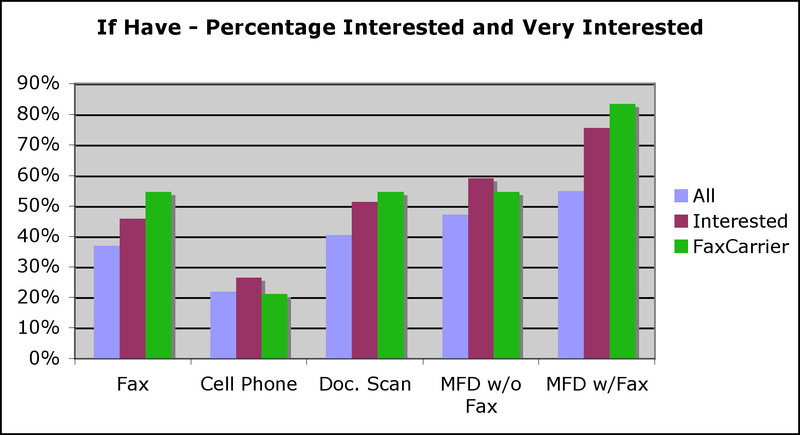 • More respondents have MFDs with fax capability than without. The percentage of respondents with standalone fax machines has declined since 2007. The 2007 survey did not ask if businesses had a document scanner or an MFD. • Respondents are interested in using a variety of existing devices to enable RDC as the following chart shows. 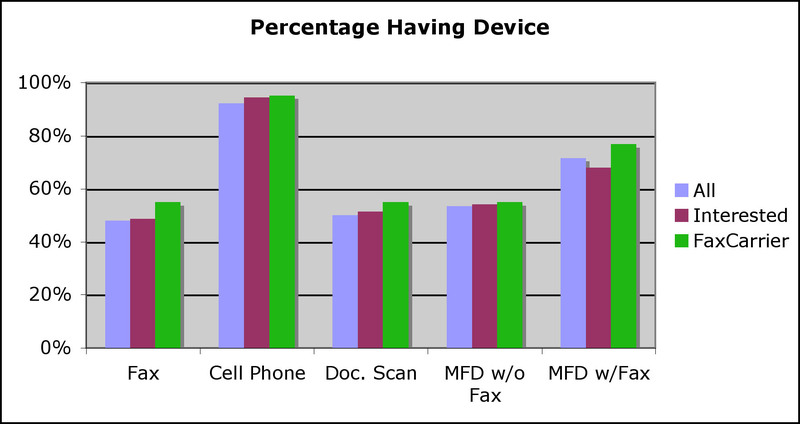 • 66% of respondents with MFDs with fax capability, would prefer to use the device with a computer application. • There appears to be interest in using carriers with devices using transmission methods other than fax. • Those interested in using a special carrier to fax checks to their bank would be willing to spend on average $.37 additional per check to make the deposit from their office. Different groups have different price points as the chart above shows with peaks in at $.10, $.25, $.50, and $1.00. While the question was asked to those interested in a carrier-based solution, the results could probably be safely applied to all types of RDC solutions. • As might be expected because of high volume and/or low value of the person going to the bank, many respondents with lower values per check were willing pay a price equal to a significant portion of their value per check. On the other hand, those with high values per check seemed not inclined to pay based on their value per check, but instead looked to what they perceived as a reasonable market price for the service. Lighthouse Consulting Group, LLC is a consulting firm focused on the needs of financial institutions, their vendors and associations. LCG has a long history of involvement in the payments system, including credit and debit cards. Since 2002, LCG has been involved with RDC. This has included identifying RDC based business opportunities, designing a stand-alone RDC appliance, and creating tools to help institutions assess their approach to RDC and how RDC might affect their branch strategy. In 2005, we launched an initiative that focused on the small business market. The result was an approach to RDC using devices small businesses already had. This patent pending method has taken two flavors. CheckFaxRDC uses special carriers to allow traditional fax machines and multi function devices in fax mode to be a cost effective RDC input source for low volume depositors. CheckFaxRDC can be implemented on a stand-alone basis or incorporated into an existing application. CheckScanRDC uses carriers to allow PC based solutions to use the automatic document feed scanner function, enabling checks to be scanned more easily and quickly. Our unique identifier ensures that check fronts and backs are correctly paired regardless of the order in which they are scanned. CheckScanRDC software can be incorporated into existing applications. For more information about LCG and its activities please contact Bob Popadic, President at 978-468-5855 or RPopadic@LCGLLC.biz. What will the role of branches be in 2015? Check 21 a Marketing Opportunity! Internet Attacks May Be the Least of Your Worries! Copyright © 2002-2011, Lighthouse Consulting Group, LLC. All rights reserved.